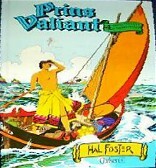 The German Carlsen publisher has started their Swedish work with 5 Harcover books in the 70ties. The first books (1 and 2) are published in 1974, they other in 1975. These are picture books based on the Max Trell stories. Do not confuse these books with the Norwegian/Danish edition! These are different titels. Carlsen is called "Carlsen If" with these series. The books are printed in Spain by Editorial Fher SA. I call this serie 1. Carlsen started a more regular serie in 1991. The books are the same as the German books, the American Fantagraphics and other Carlsen Scandinavian books, only in a different language. I call this serie 2. Prices for the first serie are 20 Euro's, for the second serie between 10-15 Euro's. Below the Carlsen logo of serie two.